We have all heard that paying more for an item of clothing can be a better investment in the long run, but it can be hard to justify. We looked at the surprising costs attached to fast fashion retailers like Zara, Forever 21, and H&M to find the hidden costs. This is the biggest myth perpetuated by fast fashion and designer discount brands. Once upon a time, stores like TJ Maxx, Saks Off 5th, and the like, operated by purchasing the excess garments that weren't sold in department stores and selling them at deeper discounts. Today, outlets and flash sales are big business. Most garments that are sold at discount stores are designed specifically for those retailers. They are designed with cheaper materials — and occasional volume discounts — to hit the price that a store like TJ Maxx wants to put on the tag. Then, the "original" price is determined by comparing it to other products that the brand sells. It was never the price for that particular garment. When I worked in fashion, bargain retailers were half of our client base. As a merchandiser, I was responsible for making separate line sheets for them (a line sheet catalogs each product name, color, price, material, etc.). The bargain line sheets were based off the original line, but they were made with different materials— read "cheaper" materials. The lesson? If a whole store is on sale, be suspicious. No one can get sale items in that volume— think about it. There is just as much at Nordstrom Rack as there is at Nordstrom. If Nordstrom couldn't sell half (or more) of the items that they stocked, they'd be in deep financial trouble. If you're looking for a discount, you'll probably be better suited sifting through the sale section of a department store, or shopping at one of the new, direct-to-consumer brands like Cuyana and Everlane, who can charge a lower profit margin because they don't have to account for third party retailers. This is the most classic selling point when it comes to calculating the benefit of purchasing an investment piece. I will be the first to admit that I have been bamboozled into thinking that just because something has a high price tag, that means that it will last for a long time. You can get swindled by luxury brands— my personal advice as someone who worked in the industry. Don't pay $100 for a t-shirt and be wary of delicate fabrics. They look lovely (and they cost a lot because they can be difficult to sew), but they can fall apart just as easily. While more expensive clothing is not always better, fast fashion clothing is almost always worse. It is designed to fall apart. When you look at the cost of fast fashion garments compared with the cost of higher quality garments, you may actually save money by purchasing something more expensive. If you buy a fast fashion blouse for $19.95, it will probably last for three months, if you're lucky. For $88, you can get real silk blouse. If that Everlane blouse lasts you a year, you will have broken even. If it lasts you two, then you will have saved close to $80. If you haven't heard of Everlane, get ready to be obsessed. It's a haven for clotheshorses looking for quality at a reasonable price. They work with a model of radical transparency, so on every product page, you can see what it cost to make the garment and how much the mark up is. Because they sell direct to consumer and don't have the overhead cost of brick-and-mortar stores, they can charge less for their products. Their $88 silk blouses, for example would retail for $190 somewhere else. Fast fashion is the second most environmentally devastating industry in the world, next to oil. Yup, you heard that right. Forever 21 is right up there with Exxon Mobile. 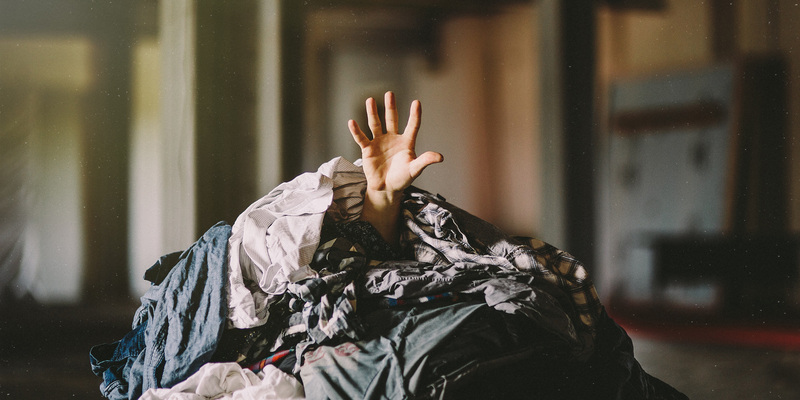 The average American throws away 68 pounds of clothing a year. Unlike food, which we also throw away in alarming quantities, clothing isn't going to break down. It's going to sit in a landfill for years upon years. Fast fashion is designed to fall apart. Garments are purchased with the idea that it's a one-wear piece of clothing. It feels really convenient when you have a party to attend and nothing to wear, but purchasing disposable clothing is so detrimental to the environment. In addition to the clothing itself becoming trash, many fast fashion retailers use an alarming number of chemicals. According to the Center for Environmental Health, three "youth-oriented clothing chains," Forever 21, Wet Seal, and Charlotte Russe, sell products with illegal levels of lead, a neuro-toxin. The tests, which were conducted by the Center for Environmental Health suggest that Russe sold these lead-contaminated garments knowingly. The environmental impact of fast fashion may seem nebulous, but it has very real consequences. If we continue to damage the environment, we are going to have to pay for it— literally. We will have to clean up the mess we have made, and that tab will be handed to the tax payers. Think of it as a reverse 401k. If we screw up the planet, your tax money is going to have to fix it later. You may end up paying thousands upon thousands of dollars for that $9 shirt down the line. Plus, you may be faced with some medical bills for longterm exposure to lead. In the end, buying fewer, quality garments is the best way to go— for your wardrobe and your wallet.